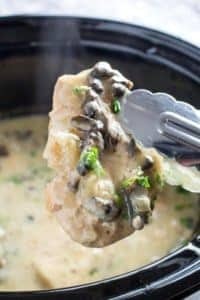 Creamy, savory, and with an (optional!) cayenne kick, this is a twist on a traditional French comfort food. 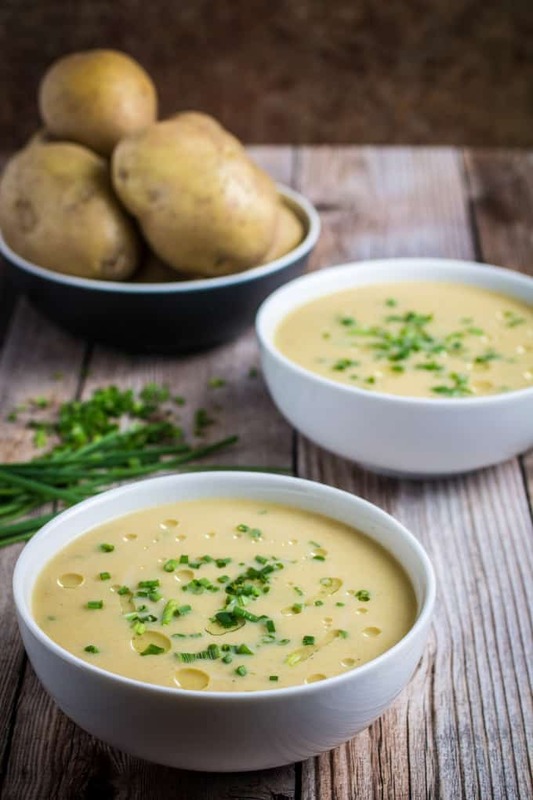 This Creamy Potato Leek Soup is so incredibly easy to make that it’s sure to become a staple in your house this winter. Just top with fresh chives and serve warm for a meal your family will love. I’ve noticed lately that it’s getting dark out much earlier now. Pretty soon I’ll be driving to work in the dark, and leaving work in the dark. But that doesn’t seem so bad when I think of the warm, home-cooked meal we’ll be having that night. It’s the time of year where I want to hibernate and just sit in my cozy house with a good book, a crackling fireplace and a warm bowl of something hot to eat. That’s right. It’s officially soup weather. Nothing quite warms you to your bones the way a good bowl of hot soup does. This Creamy Potato Leek soup does exactly that, while also satisfying your comfort-food cravings. The best part? 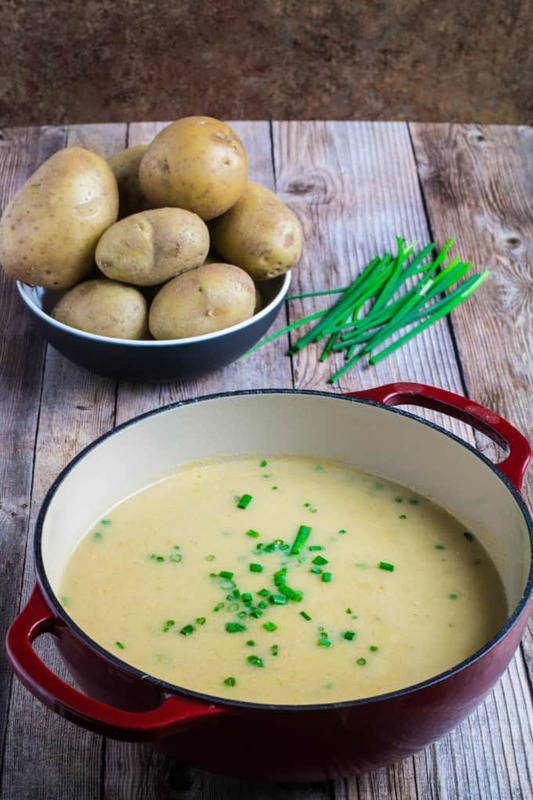 Besides for being really cheap to make (the main ingredients are potatoes and leeks), this fancy-looking soup is really, really easy to make. When I finally did make it, he had three big bowls of it. Next time, I’m planning on making a double batch. I think my hesitation has to do with the fact that we moved in August, and most of my kitchen stuff is now sitting in a storage unit. Including my immersion blender. Did I mention that Andrew and I moved back in with my parents for the next few month? It turns out that weddings and houses are expensive, particularly in the North East US, so we’re saving up for a down payment on a house, and a hall for the wedding. It’s been a bit crazy, but so far, so good. It’s not quite my own kitchen, but I do like my parent’s gas stove better than my old electric one. I just feel like cooking on real flame heats better than hot metal. That’s just my opinion, though. I’ve still cooked many delicious things on my old electric stove. So, immersion blender-less, I used my parent’s big food processor for this recipe. My other option was a blender, which would have worked just as well, depending on what you have available to you. You may have to work in batches. I scooped the entire pot of soup into the food processor in one batch, it depends how big your appliance is. After all was said and done, I’m really glad I made this. There’s only a few ingredients in this one and they’re all pretty cheap to buy (yay for easy/cheap recipes!). Potatoes, leeks, onion, butter, broth, garlic, cream, salt, pepper, and cayenne. You probably have half of these ingredients in your pantry already. Personally, this is what I do when I have leftover potatoes from another recipe. Even if I have to go buy leeks, it’s so worth it. The cayenne part is optional, if you like a bit of spice in your life. She does not like spicy food. Which I remembered a bit late. So, the cayenne is optional. If you hate spice, like my mom, then just leave it out. The soup will still be delicious, I promise. I also used a Dutch oven to make this soup. If fact, I’m going to take a moment now to express just how much I love my Dutch oven. It’s cast iron, but coated with enamel. It has superior heating abilities (we’re talking even, delicious conductivity, people). I’m pretty convinced that everything that comes out of my Dutch oven takes like magic. But mostly potato leek soup magic. If you haven’t invested in a Dutch oven yet, and you want to, I highly recommend checking Amazon. I don’t have an affiliate link for you, but mine is a Lodge brand and I bought it from there. It’s a great price as far as Dutch ovens go, and I can attest to the delicious, delicious food that’s come out of mine. Maybe one day I’ll drop $500 on a top-quality Dutch oven, but I probably won’t. If you don’t have a Dutch oven, don’t worry. It’s not a make-it or break-it kind of deal here. Just pull out your big ole’ (at least 3 quart) soup pot and follow the directions as usual. If you’re feeling particularly adventurous, you might even want to try chopping up some crispy cooked bacon to throw on top of this. I mean, come on, bacon and potatoes? It’s a win-win situation. Now if you’ll excuse me, a bowl of warm, oh-so-delicious potato leek soup is calling my name. 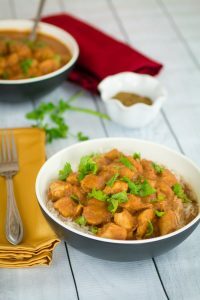 Creamy, savory, and with an (optional!) cayenne kick, this is a twist on a traditional French comfort food. 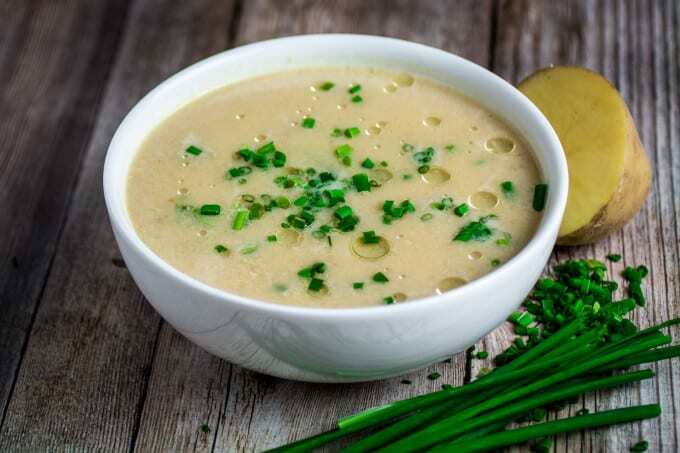 This Creamy Potato Leek Soup is so unbelievably easy to make that it's sure to become a staple in your house this winter. Just top with fresh chives and serve warm for a meal your family will love! Melt butter in 3-quart pot over medium heat. Add garlic, onion, and leeks. Cook until softened (about 5 minutes). Add potatoes, salt, pepper, and cayenne. Stir ingredients together, cover pot and cook an additional 5 minutes, or until potatoes begin to soften (about 5 minutes). Add broth, stir and bring to a boil. Reduce heat to a slow simmer. Cook until potatoes are completely soft (about 10 minutes). Either use an immersion blender, or ladle soup into a big food processor or blender. Blend until pureed and return to pot. You may have to work in batches, depending on how big your appliance is. Once pureed soup is returned to pot, reduce heat to low and stir in cream. Cook for an additional 3-5 minutes or until hot. Cayenne pepper is optional. This will make the soup spicy. You can also add more or less cayenne to taste. 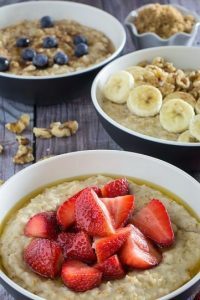 You can also top with cooked and crumbled bacon, or drizzle with olive oil for extra flavor. Previous Post: « Gluten Free Pumpkin Muffins Recipe – Soft & Fluffy! Yup, totally soup making weather now! I love this basic ingredients list. Your soup looks delicious! Thank you! I definitely agree, Adriana! This soup looks sumptuous and hearty. I will make mine extra spicy! Lol, my Mom and Hubby think I trying to burn them with spicy food. Hi Stacey, lol! Mine do, too! I’m lucky that my dad and Andrew really like spicy food. My mom doesn’t though, so I usually try to make some on the side for her. For me? Extra spice! I love potato leek soup and a little kick of spice every now and again. I never thought to add cayenne. I’ll be trying that soon. Oh and I love that it is soup weather but not that excited about it getting darker earlier. Thanks! 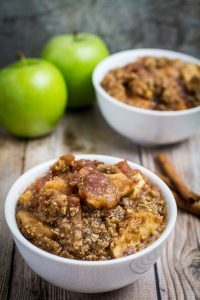 Yes, with daylight savings time, I’m definitely craving comfort food more than ever now! The photos look amazing! I can’t wait to try this….the cayenne pepper is something that is so simple, but I think it will add so much!! Thank you! I love the cayenne in this dish, I think it adds a great kick that goes well with the savory potatoes and leeks in this dish. It’s definitely an ingredient for those who like spicy food, though. Let me know how it goes, I love hearing feedback! Jacqui, all around really cool. Pic, recipe, all of it. Thanks! I love soups. And I love leeks and potatoes. This looks like comfort food of my dreams! Me, too! You definitely have to try this. It’s SO good! I love soup weather and this looks so scrumptious. I’m definitely going to try this…love the photos too btw! Really want to make this but I have a question, can I use frozen leeks instead of fresh? It’s soup weather for me here in London too, so I could do with a nice big bowl of this! I have a dairy -intolerance. Do you think I could use coconut milk or something else instead? It looks delicious! This looks amazing! Thanks so much for linking up with The Alder Collective! Hope to see you again this week! Have an awesome night! I just finished making the potato and leek soup, I also added cooked chicken to the soup, turned out delicious. I love your recipes and ideas, thank you for sharing. ? 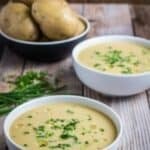 I’ve been looking for a god potato leek soup recipe and I think I have now found it! Pinning! hey what could i substitute for the light cream? could i use milk or something else instead? thanks! Made this today for lunch throughout the week. So easy and very tasty! I had to amp up the salt, pepper, and cayenne but I was a little light handed with the better than bouillon today, so that’s probably my fault. I also agree that it doesn’t need the cream at all. I did add it but I too tasted before adding and thought it was very good. 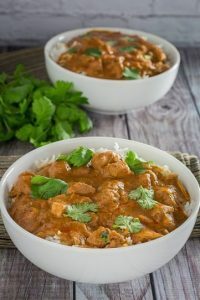 I don’t know if adding coconut milk/cream would mesh very well with the flavors. Hi Alix, I’m so glad you liked it! Yes, I could definitely eat it without the cream. I think it’s in there more for a nice creamy texture than for flavor, which my family likes. I think coconut milk would really depend on the brand and how sweet it is, but I’ve never tried. Now I’m curious! Can’t wait to try this on a rainy, cold day! I agree with you on the Dutch oven. I bought my Lodge on Amazon also. It’s bright purple and awesome! I think it was maybe $75. 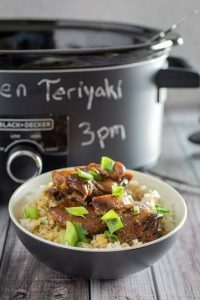 I love the Lodge dutch ovens from amazon! I just bought the bright red one from the pictures above, but I have a HUGE blue one that’s been with me since my first apartment a few years ago that I LOVE! I didn’t see the bright purple, that sounds awesome! This is, no joke, the best soup I have ever made. I haven’t even added the cream yet, and it’s already heavenly! I was making 2 other recipes at the same time, and may have simmered it a little too long, reducing the liquid by quite a bit, but I think it made it even better! I can’t wait for hubby to get home so we can dig in! Thanks so much! Sláinte! Hi, thanks for this 8s, but i was wondering if you could make extra and keep some in the freezer? I just made this tonight for my husband, son and I and was a hit!!! So full of flavor!!! So easy to make too!! My husband said to make it again!! I made this for my family last night, and everyone loved it! The cayenne added a nice complexity to the flavor without being too spicy. I only had a small white onion on hand, so I threw a shallot in there as well and it was great! I also added a tablespoon of better than bullion to up the flavor just a bit more. Thanks so much, I will most definitely be using this recipe again! Really yummy soup! I used garlic powder because I was out of garlic and almond milk. Still turned out really good. Tried before the milk and was real good. The milk made it even better! Thanks! Since we are vegan in my house, I used silken tofu in place of the light cream and vegan butter in place of the butter. 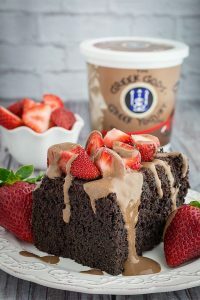 It was thick, creamy, and super filling!! This is a very yummy soup! Great soup . Made it many times . Always a hit ! OMG! 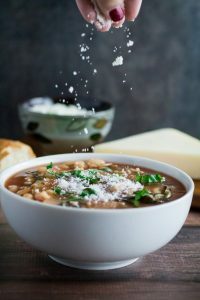 This is hands-down the best soup recipe I have ever made in my life!!! We have made it five times in the last few weeks it is unbelievable! Also it keeps SO WELL. I LOVE IT! I stumbled across this recipe on Pinterest- i made it tonight and it totally hit the spot! This recipe came together so quickly. I used the 1/4 tsp of cayenne and as much as i love a little heat this with a bit too much for me. Next time i will add less but overall the flavor is so great. Im already looking forward to left overs an sharing the recipe with other Montana mommas. Thanks!